One of the most difficult obstacles to overcome in the e-commerce business model is an abandoned cart. Nine out of every ten users don’t finish their purchases in an online store and take a step backward during the payment process. 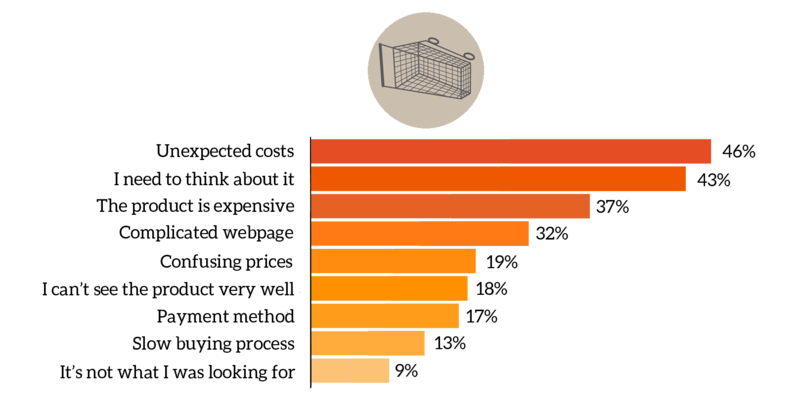 Do you know the reasons why your clients abandon their carts? These data, published by Ve Interactive, translate as a loss of hundreds of millions of euros per year, and also suggest that the risk of an abandoned cart increases by 1% for each information field that is required during the purchasing process. Furthermore, it’s been pointed out that the reasons for abandoning a cart present themselves to the customer before they arrive at check-out. Some of these reasons are, simply, a lack of transparency with the client and it’s something that shouldn’t happen. Others, lean more towards economic limitations, like not facilitating various payment methods for example, but there are also technical complications like a slow purchasing process. However, other consequences can clearly be solved with good customer service. In a physical store, the sales associate helps the customer find what they’re looking for: they show the client the product, compare prices, and solve any problems the customer might have until the purchase is finalized. This is what Oct8ne does. The agent can anticipate the customers’ questions and give them the answers they need, which means, when a client can’t find a product or they need to see it better, the salesperson can show every detail of a product by using the coviewer. Normally, the abandonment rate is between 55 and 80%. Oct8ne has been able to reduce it to 33%. A lack of information generates doubts for users and, as a consequence, they end up leaving the store to read about more characteristics or features. However, if the agent offers the correct solution ahead of time, the client is more convinced and isn’t lost on the way to checkout. Both the agent and the client can add the chosen items directly to the cart from the coviewer while continuing the conversation. The fact that the agent is present during purchasing decisions is crucial. When a customer starts a conversation through a conventional livechat and then goes to a different section of the page, both the chat and the agent’s attention are lost. But, Oct8ne’s algorithms allow the sales associate to remain in the chat while the client is browsing other areas of the website. The reasons that each client doesn’t finalize his purchase depend on many factors and, as such, our sales suites are focused on rescuing the client at the crucial moment to avoid losing the sale. Why wait until they abandon their cart to try to get them back with an email?